Have you ever been confused about whether to use an Upper or Lower Case Letter? (A Capital Letter or a "small" letter?) When do you use a C or a c? An F or an f? 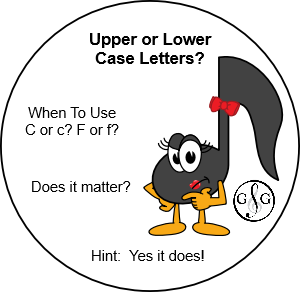 In this Upper or Lower Case Letter Blog, we are going to look at the rules behind the use of identifying concepts with either an Upper Case (Capital) Letter for the note name or a lower case ("small") letter for the note name. First of all, the key is to be consistent. In the Ultimate Music Theory Workbooks, we have been consistent in our use of identifying a musical alphabet letter name (A, B, C, D, E, F, G) with the proper Capitalization. The decision to use an Upper or lower case is based on the function of the musical alphabet letter name. Is it describing a Key on the Keyboard, a note on the staff, or is it creating a specific tonality? To CAP or not to cap? That is the question! (With nods to Shakespeare! LOL) Here are some answers. 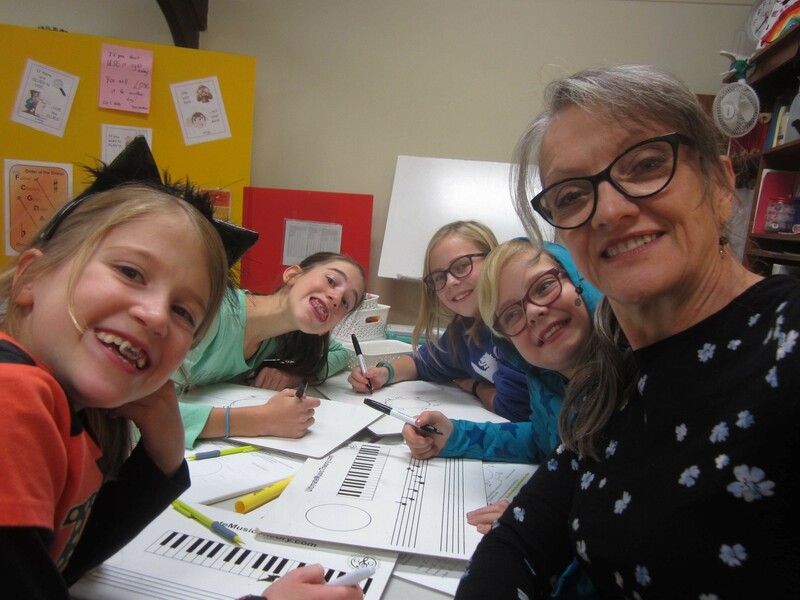 This Blog has been inspired by a conversation with Joanne Barker UMTC, an amazing Teacher here in Ontario, Canada. Joanne asked if there is a correct way to use Capital (Upper Case letters) and small (lower case letters). During our conversation, we discussed that we often get into the habit of just using an Upper Case letter (Capital) for anything Major and a lower case letter (small letter) for anything minor. This does work for many things that are identified as Major or minor. However, a Root/Quality Chord Symbol is always an Upper Case letter (even if the chord is Major, minor, Augmented or diminished). Joanne wrote: "This makes sense...the name of a note is a Capital - so the name of the chord should start with a Capital... like "Joanne Happy" for Major and "Joanne sad" for minor... my name doesn't change, just my mood. The name of the key is different - it is not naming a particular note, but a scale - the whole thing is minor... so use a lower case to stress the point. This is kind of like writing an email all in CAPITALS to prove a point only the opposite, using all lower case to prove a point. I think you have just helped me come up with a gimmick to use with my students." Thanks Joanne! This does make sense! So, let us review exactly what uses an Upper or lower case letter. When identifying (naming, writing) a letter name that specifically refers to the name of a note on the staff or the name of a key on a keyboard, ALWAYS use an Upper Case Letter. I explain to my Students that the name of the note is "E", so we use an Upper Case Letter. The name of the Student in this picture is Ewan. He uses an Upper Case Letter as the first letter when spelling his name. When Ewan identifies the name of the white key that is at the top right of the two black key groups, he uses the Upper Case Letter of "E". Why? Simply because the name of that White Key is E! When Ewan identifies the name of the note that is on the 2nd Ledger Line above the Bass Staff, he uses the Upper Case Letter of "E". Why? Simply because the name of the note written on the 2nd Ledger Line above the Bass Staff is E! A Key Signature has a Major or a minor tonality and is identified as Major or minor. There is no need to identify whether the piece uses the notes of the harmonic minor or the melodic minor scale - it is simply identified as "minor". 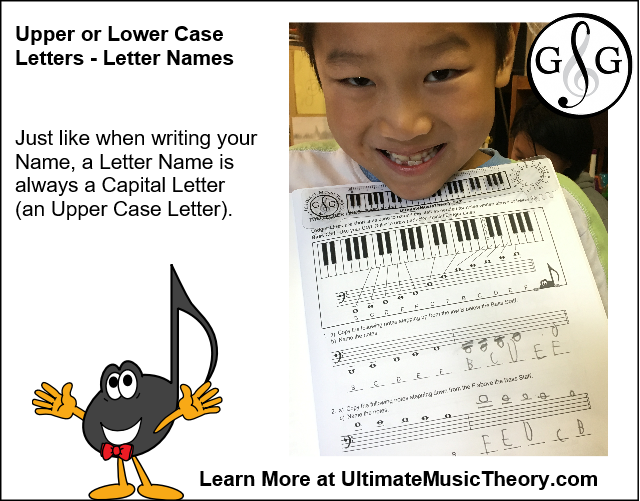 The most common way of notating the Key of a piece is to use an Upper Case Letter for a Major Key (for example: C Major) and a lower case letter for a minor key (for example: c minor). In the Ultimate Music Theory Series, we consistently use a capital M for "Major" and a lower case (small) m for "minor". However, it is also acceptable to use a capital M for "Minor". Whichever way you choose to write tonalities, the key is to be consistent with your students. 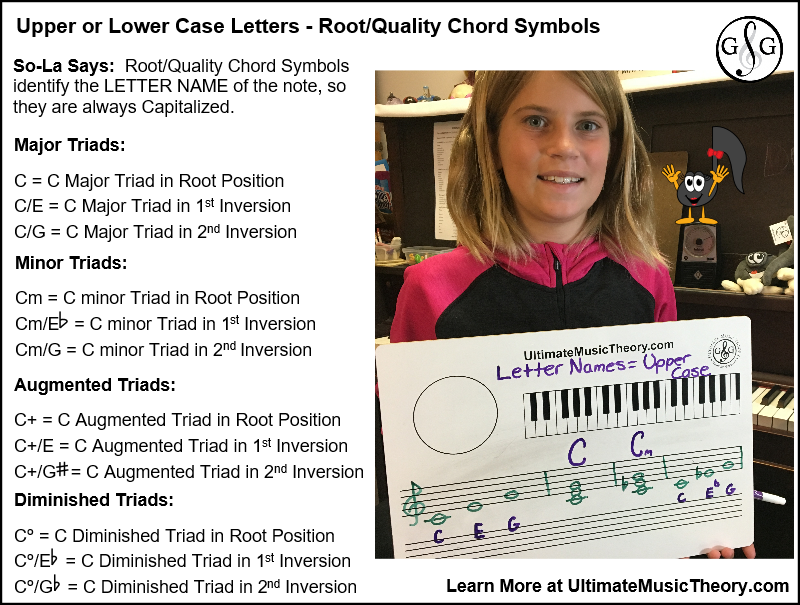 Identifying and Writing Root/Quality Chord Symbols is now a requirement of some nationally recognized Theory Examination Programs. In the Ultimate Music Theory LEVEL 2 Supplemental Workbook, Students learn how the Functional Chord Symbol (Roman Numeral) and Root/Quality Chord Symbols (Major and minor tonalities) for the Tonic Triads in Root Position. In the Ultimate Music Theory LEVEL 3 Supplemental Workbook, Students are the Functional Chord Symbols and Root/Quality Chord Symbols for the Tonic and Dominant Triads in Root Position. In the Ultimate Music Theory LEVEL 4 Supplemental Workbook, we add the Subdominant Triad. 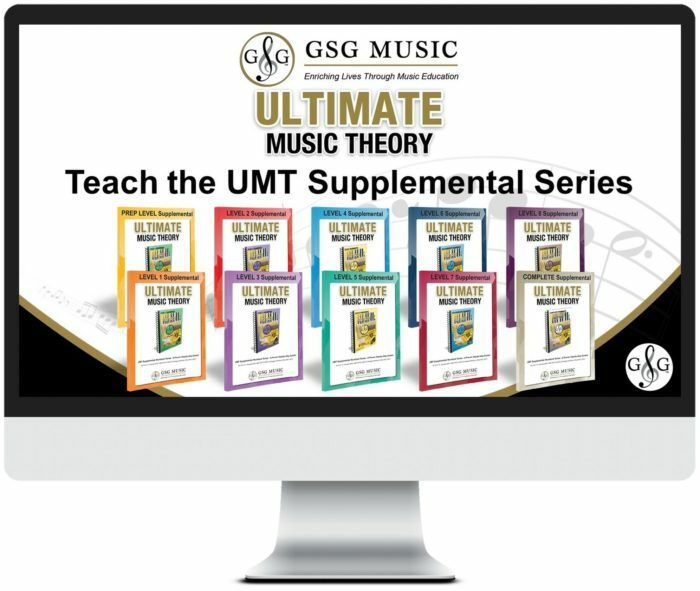 In the Ultimate Music Theory LEVEL 5 Supplemental Workbook, Students learn how to write the Tonic, Subdominant and Dominant Chords and Root Position and in their inversions. In the Ultimate Music Theory LEVEL 6 Supplemental Workbook, Dominant Seventh Chords are added as Complete and Incomplete Chords (in open position and in close position). In the Ultimate Music Theory LEVEL 7 Supplemental Workbook, Students are taught about the Root/Quality Chord Symbols (and Functional Chord Symbols) for Triads/Chords built on any note of the Major and Harmonic Minor scale (including the Leading Tone Diminished 7th Chord). Understanding Root/Quality Chord Symbols inspires Students to improvise and compose. Playing music using a "Lead Sheet" (where the melody is written in notation on the Staff, but the harmony is specified with Chord Symbols above the Staff) opens up a new dimension in music for Students. When naming scales, we have that additional concept of Tonality (Major and minor) that has Schools of Music offering different options. Thanks for exploring Upper or Lower Case Letters with me in this blog! If you have a question about theory concepts, do not hesitate to email me at [email protected] You might be the inspiration for my next blog!